Highgate continues its long time association with Future Estate being engaged to manage the 144 apartment complex completed in March 2018. This is the 2nd of three stages on the Parc Vue development. 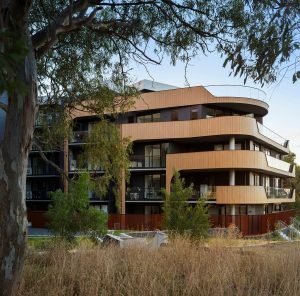 The building fronts onto Bundoora park and has impressive views of the Melbourne CBD from its lofty vantage point. The 1, 2 and 3 bedroom apartment project achieves a high aesthetic whilst being built for an extremely cost effective outcome. One of the key features to the facade in this project designed by MAP Architecture and Design is the metal panelling that produces a highly textured thoroughly convincing timber cladding look. 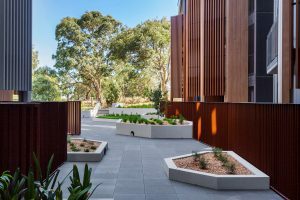 The result is to give the building a softer natural material appearance that complements the neighbouring park whilst also presenting a distinctive contemporary design.